October 22 is the feast day of Saint John Paul II. Here is his moving homily at a Mass in the Shrine of Our Lady of Calvary in Poland, during his final apostolic trip to his homeland. 1. Today I come to this Shrine as a pilgrim, as I used to come when I was a child and as a young man. I come before Our Lady of Calvary as I used to come as Bishop of Krakow to entrust to her the problems of the Archdiocese and of those whom God had entrusted to my pastoral care. I come here and, now as then, I repeat: Hail, Hail, Holy Queen, Mother of Mercy! How many times have I seen that the Mother of the Son of God turns her eyes of mercy upon the concerns of the afflicted, that she obtains for them the grace to resolve difficult problems, and that they, in their powerlessness, come to a fuller realization of the amazing power and wisdom of Divine Providence? Has this not been the experience of the generations of pilgrims who have come here for four hundred years? Indeed it has. Otherwise today’s celebration would not be taking place. You would not be here, dear friends, you who tread the Paths of Kalwaria, tracing the steps of Christ’s Passion and Cross and following his Mother’s journey of compassion and glory. This place wondrously helps the heart and mind to gain deeper insight into the mystery of that bond which united the suffering Saviour and his co-suffering Mother. At the centre of this mystery of love everyone who comes here rediscovers himself, his life, his daily existence, his weakness and, at the same time, the power of faith and hope: that power which springs up from the assurance that the Mother does not abandon her children at times of trouble, but leads them to her Son and entrusts them to his mercy. At that moment, standing beneath the Cross, could she expect that in a short time, in three days, God’s promise would be fulfilled? This will remain forever a secret of her heart. We do know one thing, however: she, the first among all human beings, shared fully in the glory of her Risen Son. She – as we believe and profess – was assumed body and soul into heaven in order to experience union in glory, to rejoice at her Son’s side in the fruits of Divine Mercy and to obtain them for those who seek refuge in her. 3. The mysterious bond of love. How splendidly is it expressed in this place. History relates that at the beginning of the seventeenth century Mikołaj Zebrzydowski, the founder of the Shrine, laid the foundations for the chapel of Golgotha, which was to be built on the model of the Church of the Holy Sepulchre in Jerusalem. He thus wished, above all else, to bring nearer to himself and to others the mystery of Christ’s passion and death. Later, however, when he planned the building of the paths of the Lord’s Passion, from the Upper Room to Christ’s Tomb, guided by devotion to Mary and divine inspiration, he wished to place along that path a series of chapels commemorating events in the life of Mary. And thus other paths sprang up, together with a new religious practice, one which in a certain sense would complement the Way of the Cross: the celebration of the so-called Way of the Compassion of the Mother of God. For four centuries, ever new generations of pilgrims have walked here in the footsteps of the Redeemer and of his Mother, drawing abundantly from that love which resisted suffering and death, and found its crowning in the glory of heaven. During those centuries, the pilgrims were faithfully accompanied by the Franciscan Fathers, known as “Bernardines,” who were charged with the spiritual life of the Shrine of Kalwaria. Today I wish to express to them my gratitude for their particular love for Christ who suffered and his Mother who co-suffered: a particular love which with fervent devotion they pour into the hearts of pilgrims. Dear Bernardine Fathers and Brothers, may God in his goodness bless you in this ministry, now and in the future! 4. In 1641 the Shrine of Kalwaria was enriched by a particular gift. 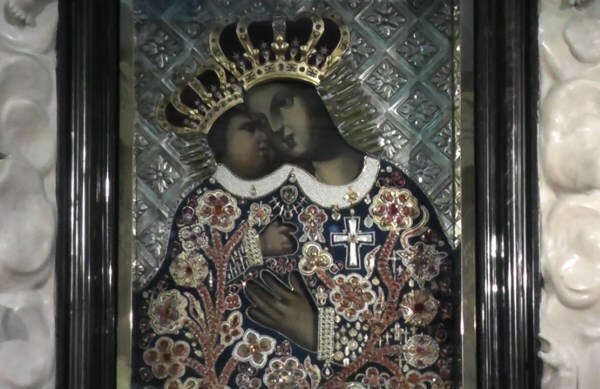 Providence guided here the steps of Stanisław Paszkowski of Brzezie, who wished to entrust to the custody of the Bernardine Fathers the image of the Most Holy Mother, which had already become famous for its graces when it was located in his house chapel. From that time on, and particularly after the day in 1887 when, with the approval of Pope Leo XIII, it was crowned by the Bishop of Krakow, Albin Sas Dunajewski, pilgrims have concluded their pilgrimage in her sight. At the beginning the pilgrims came here from all parts of Poland, but also from Lithuania, Rus’, Slovakia, Bohemia, Hungary, Moravia and Germany. The natives of Silesia were especially devoted to her; it was they who offered the crown to Jesus and, from the day of the crowning until the present, they have taken part each year in the procession on the day of the Assumption of the Blessed Virgin Mary. which for centuries has remained faithful to you and to your Son. which has always placed its hope in your maternal love. obtain what your children most need. Open the hearts of the prosperous to the needs of the poor and the suffering. Enable the unemployed to find an employer. Help those who are poverty-stricken to find a home. Grant families the love which makes it possible to surmount all difficulties. Show young people a way and a horizon for the future. Confirm religious communities with the grace of faith, hope and love. Grant that priests may follow in the footsteps of your Son by offering their lives each day for the sheep. Obtain for Bishops the light of the Holy Spirit, so that they may guide this Church to the gates of your Son’s Kingdom by a single, straight path. that I may carry out to the end the mission given me by the Risen Lord.